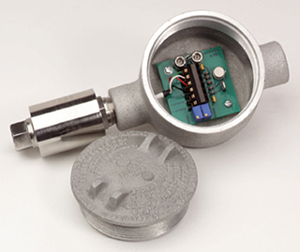 Find how a Pressure Transducer works on this link or how we can customize your Pressure Sensor. OMEGA’s PX02 Series are high accuracy, industrial pressure transmitters. All stainless steel construction and sealed case makes the PX02 suitable for harsh industrial environments. FM Intrinsically Safe approvals are standard. A broad temperature compensated range of 16 to 71°C (60 to 160°F), high operating range to 121°C (250°F) and excellent temperature compensation make this transducer very stable for applications with fluctuating temperatures. The PX02 is available in gage, absolute or sealed models as in psi or metric ranges. Nota: 2 and 5 psi Ranges available only on amplified output. 1/4 HP Tube Fitting supplied for ranges 10,000 psi and above.